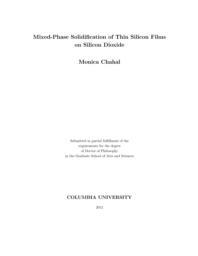 In this thesis, we present a new beam-induced melt-mediated crystallization process called mixed-phase solidification (MPS) that can produce defect-free, large-grain polycrystalline-Si films with strong (100)-surface texture (>99%) on SiO2. Such a combination of microstructural attributes makes the resulting MPS material well-suited for high-performance electronic and photovoltaic applications. The MPS method was conceived based on a well-known phenomenon of coexisting solid-liquid regions in radiatively-melted Si films on SiO2. Through our investigations, we have discovered that multiple exposures (of an initially amorphous precursor) in air within the solid-liquid coexistence regime can lead to the generation of such a material. In the course of this thesis, we have also identified the optimal processing conditions for obtaining such a microstructure, as well as the physical factors that control the process. A systematic parametric study of the single- and multi-scan MPS process is performed using thin Si films on SiO2 irradiated via a continuous-wave (CW) laser system. We employ an in situ microscopic viewing system to directly observe and understand melting and solidification during the MPS process. Additionally, in order to investigate the grain boundary melting phenomenon, we have conducted "rapid-quench" demarcation experiments and established a one-to-one correspondence between the in situ data and the single-/multi-scan MPS processed microstructure. The experimental results show an incremental increase in grain size and (100)-surface texture with an increase in scan number. The grain size is found to reach an apparent soft saturation value as the number of scans increases. For a given number of scans, a decrease in power or an increase in velocity is found to decrease the grain size and (100)-surface texture. Increases in film thickness lead to an increase in grain size, but a reduction in (100)-surface texturing. Based on what we have experimentally observed, as well as what has been previously established regarding the radiative-melting of Si, we propose a thermodynamic model to account for the microstructural evolution observed in the MPS process (i.e., partial-melting and solidification of polycrystalline-Si films). The model is built on two fundamental considerations: (1) the near-equilibrium environment within which thermodynamic factors dominate the transitions, and (2) the dynamically balanced, yet continuously changing, thermal surroundings. According to our model, the physical melting-solidification sequence for an MPS cycle of polycrystalline-Si films can be described in terms of the melt being initiated first at grain boundaries, and melting and solidification subsequently proceeding primarily laterally at interface-location specific rates as determined by the local curvature and local temperature at a point in the solid/liquid interface. By analyzing the cross-sectional profile of solid/liquid interface, we correlate the local curvature of the interface to the solid-Si/SiO2 interfacial energy and the resulting local equilibrium melting temperature using the Gibbs-Thomson relationship. This local-interface-curvature analysis reveals how the anisotropic nature of the Si/SiO2 interfacial energy and the film thickness affect the surface texture evolution observed during the MPS processing of Si films on SiO2. Our model of MPS is noteworthy in that it is in contrast to the "variable-grain-melting-temperature" argument which has been previously invoked in order to explain similar observations of texture selection; we suggest that such an argument is not thermodynamically consistent, and furthermore, cannot account for the evolution of the microstructure observed in the multi-scan MPS of polycrystalline films. Based on (1) our understanding of the MPS process as interpreted by the above model, and (2) the experimental results, we have also deduced fundamental thermodynamic details of the system. Specifically, by scrutinizing the evolution of the distribution of solid surface orientations in the MPS processed samples, we have extracted the hierarchical order of the Si/SiO2 interfacial energies as a function of grain orientation. We propose, in accordance with our model, that the experimentally observed soft saturation grain size values can be determined from the considerations related to the stable coexistence of solid-liquid mixtures. We substantiate this argument by performing a Mullins- Sekerka-type interface-instability analysis. Specifically, the maximum allowed solid-liquid coexistence distances, which were calculated with an explicit consideration given to the accompanying emissivity changes, were found to correlate well to the experimentally measured grain size value obtained after multi-scan MPS processing. Also, we discuss certain factors encountered during the MPS process (such as slow solidification rates, stable interfaces, and the highly unusual inverted thermal profile) as being responsible for the formation of defect-free grains. Finally, recognizing that the MPS process requires neither the laser nor the scanning of a highly localized beam, we also demonstrate how the MPS process can potentially be implemented in a practical manner using an incoherent light source. Using a xenon-arc flash-lamp system we show how the MPS method can be liberated from the challenges and constraints that are associated with laser-based systems, and thus represents a potentially cost-effective and scalable option.